The Foxborough Historical Society (FHS) was first formed in 1898 and is an all volunteer, not for profit organization, that strives to promote the history of Foxborough Massachusetts. 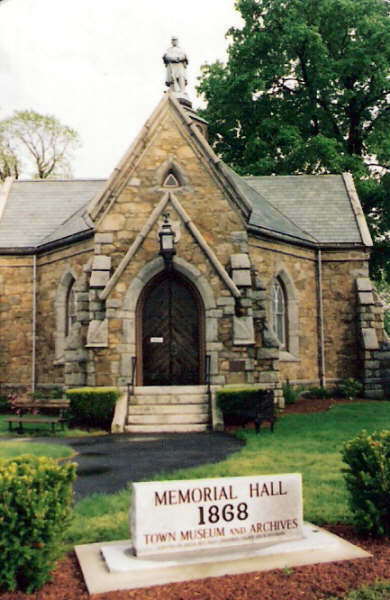 The Foxborough Historical Society normally meets monthly, on the fourth Tuesday of each month, except during the summer months of June thru August. Regular meetings are normally held at 7:30 pm, in the Fuller Room lower level, Boyden Library. While the library is under construction, all meetings will be held at the Senior Center on Central Street. All meetings are open to the public. Membership to the society is available at rates starting at just $8 per calendar year. All members receive our periodical email newsletter or postcard and notification about upcoming society programs. A PDF membership form to the Historical Society is available here [PDF].